Behind the hotel parking lot were the Peanutmobile(?) and something similar to, but not exactly the same as, the Weinermobile. I have no explanation for this. 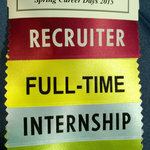 Our name tags had a ridiculous number of flair. I was afraid the name tag would collapse under the weight, but luckily it did not. 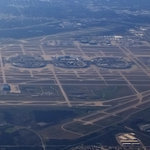 On the way home, I got this picture of DFW airport from the air! You can see the three circles that are the terminals and all the different runways/taxiways.